Home > Fitness Testing > Tests > Anthropometry > Body Composition > B.I. A Bioelectric Impedance Analyzer is a sophisticated scientific instrument, used in research and analysis. 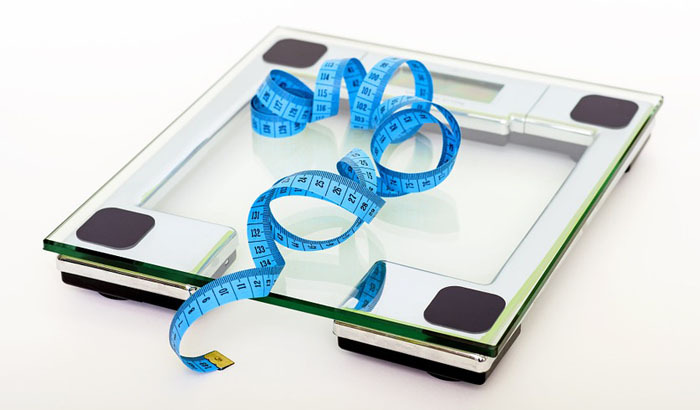 On a budget level, many bathroom type weighing scales are also available with a Bioelectric Impedance Analyzer, which is two built-in footpad electrodes on the base of the scale which the person stands on. procedure: As the bioelectric impedance device measures the resistance of body tissues to the flow of a small electrical signal, the person being measured should not be in contact with any other non-conducting surface, with legs apart and arms away from the body. Some devices require a pair of electrodes are placed on the hand and wrist, and another pair placed on the ankle and foot (usually opposite sides of the body), while other devices simply require you to stand on two foot plates. Follow the instructions of your particular device. See Video of a BI Test. how it works: Bioelectrical impedance measures the resistance of body tissues to the flow of a small, harmless electrical signal. The proportion of body fat can be calculated as the current flows more easily through the parts of the body that are composed mostly of water (such as blood, urine & muscle) than it does through bone, fat or air. It is possible to predict how much body fat a person has by combining the bioelectric impedance measure with other factors such as height, weight, gender, fitness level and age. advantages: this method of body composition analysis is very simple and quick to perform, and if you have the right equipment can be done at home. disadvantages: The equipment is relatively expensive (units on the low end of the scale are available for about $100), with prices ranging up to thousands of dollars. other comments: Bioelectric impedance analysis is based on the principle that the resistance to an applied electric current is inversely related to the amount of fat-free mass within the body. This method does not take into account the location of body fat. contraindications: People with pacemakers should not use Bioelectrical Impedance for body composition analysis. See Video of a BI Test.